Vanessa Marano began acting professionally at the age of seven. According to an interview with her sister, her mother did not want either of her children to have careers in show business, and took the girls to an agent that she believed was most likely to turn kids down, only to find that Vanessa was accepted. Her sister Laura, who was on the scene with her, also impressed the agency. Since then, she has worked for productions at the Stage Door Theater. Marano's first major roles on television have been as Jack Malone's older daughter in Without a Trace (she and real life sister Laura play sisters), Valerie's stepdaughter in The Comeback and as April Nardini in Gilmore Girls. She also played Layne Abeley in The Clique based on the books by Lisi Harrison and Samantha Combs in Dear Lemon Lima. Marano starred in an episode of Ghost Whisperer alongside Jennifer Love Hewitt. Marano played Eden on The Young and the Restless and Hope on Scoundrels. Since June 2011, she has starred as Bay Kennish on the ABC Family TV show Switched at Birth. In 2013, she starred in Restless Virgins which was inspired by a true story. Marano was born in Los Angeles, California. Her mother, Ellen, is the owner of Agoura Children's Theatre. Her younger sister, Laura Marano, is also an actress. Marano speaks Italian, and her father is of Italian descent. 2004 Grounded for Life Lexie Episode: "Tombstone Blues"
2005 Malcolm in the Middle Gina Episode: "Malcolm Defends Reese"
2008 Miss Guided Kelly Episode: "Homecoming"
2008 The Closer Theresa Monroe Episode: "Problem Child"
2008 Ghost Whisperer Alise Jones Episode: "Ghost in the Machine"
2010 Past Life Susan Charne Episode: "Dead Man Talking"
2010 Medium Jennifer Whitten Episodes: "There Will Be Blood.. Type A", "There Will Be Blood... Type B"
2010 Parenthood Holly Episode: "Date Night"
2011 Private Practice Casey Episode: "The Hardest Part"
2011 Love Bites Becky Lerner Episode: "Too Much Information"
2011 CSI: Crime Scene Investigation Samantha Cafferty Episode: "CSI Down"
2012 Grey's Anatomy Holly Wheeler Episode: "The Girl with No Name"
2013 Perception Riley Episode: "Toxic"
2014 NCIS: New Orleans Natalie Lane Episode: "The Recruits"
2016 Outcast Sherry Episode: "The Road Before Us"
2016 Gilmore Girls: A Year in the Life April Nardini Episode: "Summer"
2017 Silicon Valley Stanford University student Episodes: "Intellectual Property", "Teambuilding Exercise"
2018 Station 19 Molly Episode: "Not Your Hero"
^ "Vanessa Marano". Hollywood.com. Retrieved September 27, 2016. ^ Jeffrey Dransfeldt (January 25, 2009). "Agoura Hills sisters are young stars on the rise". Ventura County Star. Retrieved February 7, 2013. ^ "Laura Marano on "The Better Show"". YouTube. ErgMarano (Originally: "The Better Show"). November 5, 2013. Retrieved June 20, 2014. ^ Barney, Chuck. "Chuck Barney: 'Switched at Birth' another winner for ABC Family." San Jose Mercury News, June 29, 2011. Accessed on July 18, 2011. ^ Agoura's Children's Theatre (ed.). "Improvisation". Archived from the original on October 29, 2013. Retrieved August 29, 2013. ^ "11 Questions with "Switched at Birth" Star Vanessa Marano!". June 6, 2011. Archived from the original on June 14, 2011. Retrieved April 14, 2012. ^ Mulcahy, Jr., Kevin (June 3, 2011). "Q&A: Switched at Birth's Vanessa Marano". We Love Soaps. Retrieved August 5, 2011. ^ "Tommy2.net". tommy2.net. Retrieved March 9, 2017. ^ Ng, Philiana (May 22, 2013). "Teen Choice Awards: 'Twilight: Breaking Dawn - Part 2' Leads First Wave of Nominees". The Hollywood Reporter. Retrieved May 23, 2013. 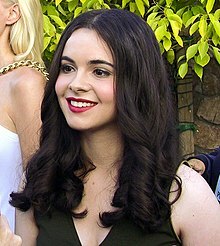 Wikimedia Commons has media related to Vanessa Marano. This page was last edited on 6 January 2019, at 02:35 (UTC).